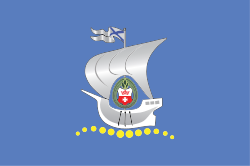 Kaliningrad (Russian: Калинингра́д; Lithuanian: Karaliaučius; German: Königsberg (help·info); Polish: Królewiec; briefly Russified as Russian: Кёнигсберг Kyonigsberg) is a seaport and the administrative center of Kaliningrad Oblast, the Russian exclave between Poland and Lithuania on the Baltic Sea. It is surrounded by NATO and European Union members Poland and Lithuania and is geographically separated from the main part of Russia itself. Borderless connection is only possible by sea or air. In 2002, it had a population of 430,003 people. This was more than in 1989, when the last census was done. At that time, the city only had a population of 401,280. About 78% of the people there are Russians, 8% Belarusians, and 7.3% Ukrainians. It was named Königsberg originally. It was the capital city of the German province of East Prussia, the earlier Duchy of Prussia, and before that of the Monastic State of the Teutonic Knights. The city had that name from 1254 to 1945. The people were mostly Germans but they were expelled and replaced. One of the famous people from Königsberg was the philosopher Immanuel Kant. Wikimedia Commons has media related to Kaliningrad. This page was last changed on 28 June 2018, at 22:28.